Miso, or soy bean paste can be divided into three basic types: 1. kome miso or rice miso made from fermented rice, soy bean and salt; 2. mugi miso or wheat miso made from fermented wheat, soy bean and salt; and 3. mame miso or soy bean miso made from fermented soy beans and salt. Miso is often categorised according to its place of origin, but you should be able to figure out which of the three basic types your miso of choice is from the packaging. The amount of miso you use when making miso soup varies according to the salt content and the age of the miso, so always do a taste check. 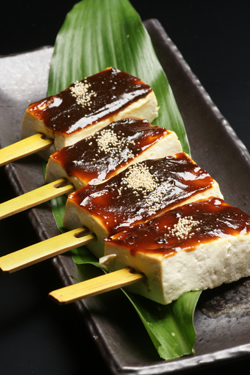 Like most Japanese foods, miso’s origin is believed to be China. Called hisio, it was originaly a seasoning derived from soy bean, wheat and salt fermentation and was believed to have come to Japan around the 7th century. Commercial production of miso in Japan probably began in the 17th century. The basic process of making miso involves introducing a vitamin B-12 synthesising fungus to steamed soy beans and salt (and other grains) and letting it ferment, then grinding it into a thick nutty paste. Miso is a good source of protein, B-vitamins and minerals though low in fat and calories. Hence, it has been adopted by vegans, vegetarians and the health conscious as a wonder food. But beware. Miso is high in salt content (especially the darker miso). Furthermore, as it is a soy bean product, many people may experience allergic reactions to it and remember that some miso contains wheat. Miso keeps well in the fridge and as miso is fermented, don’t worry too much about the use by date. Sometimes, the colour may change, or it may dry up if not covered properly. 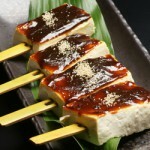 Miso can also be kept in the freezer as well, especially the kinds that have a shorter fermentation period. Saikyo miso should be kept in the freezer at all times.